i absolutely love this set. it went perfectly with the decor and was the "neutral" color scheme i was looking for. For a warm, lodge look in your space, the Madison Park Westbrook Collection is perfect for you. The unique fabric used in this set has a textured earthy print pieced with polyester microsuede at the bottom and buttons for a personal touch. Three decorative pillows using piecing and embroidery of both top of bed fabrics completing this cohesive look. Machine washable for easy care, this comforter set brings a refresh update to your bedroom decor. Dimensions 90.0 In. X 90.0 In. X 1.5 In. The picture does this set no justice! Purchased this set after seeing it here. I thought it would be a good addition to my bedroom. I did not immediately open it and actually forgot about it. Yesterday while cleaning my room, I remembered I'd purchased this set, but, wasn't too excited about it. I opened it and was immediately impressed. The picture cannot capture how soft this set is...The comforter is perfect, not too light, not too heavy. 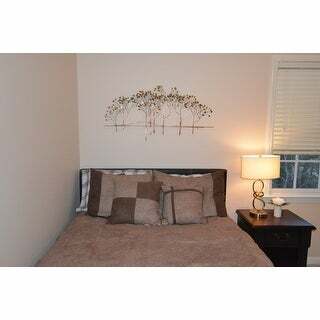 The included shams and decorative pillows add to the lovely look of this set. You will not be disappointed. Looks great but photo is deceiving. It's not that long. Could be 8 inched longer. I used a steamer to get the packing wrinkles out. I Love This Comforter Set! This is a great comforter set. I bought it for the spare bedroom of my daughters house where I would be staying. I actually put it on a futon bed that I'd be sleeping on. Wow! Wonderful! It was also very cold there dipping down into the 20's every night and it kept me snuggly warm. I never wanted to get out of bed in the morning. :) The pillows all match perfectly and complete the ensemble. Great price too! Ok. So, like many others have said, the color is WAY off. In the picture, it looks brown on the end, and then sort of a washed Khaki color in the middle. It's pretty much all brown. That being said, however, it still looks nice. Just not like the picture. Not nearly as much contrast between the colors. It's soft, and very nice. Perhaps a little too light-weight. Could definitely have more filling, but not bad. And, I ordered the Queen. The queen comforter seems a tad small. Only hangs a few inches off the sides. It just depends on personal preference. I prefer the sides and bottom to hang a little further off the edges of the bed, so I'm returning mine in exchange for the King size. Colors are as shown. Pillows full, comforter full. Seems to very great quality for the money! I have a California king bed. I ordered the California king set. The comforter is beautiful but the width is not long enough. The length is perfect. Other than that The quality and value is excellent. Excellent quality, price and comfortable. OK. This is one of the softest and beautiful comforters I've purchased in a long time. It’s hard to find an item that’s this beautiful and soft. I know this is being such a wonderful product for the winter. Pros: Beautiful and worth the price. Cons: None. FOR THE PRICE, WAS VERY PLEASE WITH THE QUALITY, LOOKS EXACTLY AS PICTURED. Arrived fast, great fabric, goes great in any unisex room that you don't want to be too boyish or too feminine. I really loved the look of this comforter it was just what I was looking for. I washed it one time and followed the directions to the letter and it faded like the print came off in two largest spots. This was such a disappointment. I got this set and actually love the feel and comfort of it, but the color was way off! I got it because I like the color contrast. Where it shows lighter on the comforter, it is dark. Hardly any contrast at all. Not like the picture. I was disappointed in the look of this bedding is it doesn't really look as pretty as it does in the photo. The neutral area is much darker than itmlooks in the photo. Nice product considering the markdown. Would have been disappointed if I had paid full price. I do like the colors. I used this comforter for about 3 years, and still love it to this day. Only fall back is I am uncomfortable washing it in my machine due to the buttons so I pay to have it dry cleaned. This looks perfect in our spare bedroom and we’ve received multiple compliments. It goes nice with our rustic decor and appears to be nice quality. Fast shipping! Very pleased! Beautiful comforter set. Colors are much prettier than portrayed. Quality is exceptionally well designed. It is exactlly what i was looking for. Could not beat the excellent price any where else. Nice comforter set for our sons room who is very picky. The colors are true to the website. It was getting the additional pillows to dress the bed up. I absolutely love this comforter. It is a nice and heavy comforter for the winter. It’s a little heavy for spring and summer but it’s in a very attractive comforter. My son loves it because it’s heavy. This item is well made. Hard to wash in the wash machine. Nice quality-exactly like picture. I loved the colors and the throw pillows are really cute. Looks great in my master bedroom. I have not had to wash the quilt so I cannot give any information as to how the quilt will was. Would recommend. 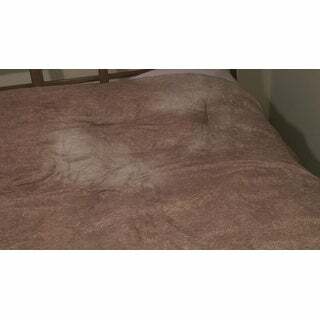 Decent value for the price, but be very careful when washing the comforter. The padding inside gets bunched up & takes some work to get it right again. Looked great coming out of the package. "Is the entire comforter microsuede?" The comforter and pillows are. I find the comforter too hot to sleep under -- it doesn't breathe. Yes, it is entire comforter micro suede. The above is print microsuede and bottom is solid microsuede. "Is this set a chocolate color or more green? i don't want to have to change all my pictures and valances"
I can see where you might see some green in it, but rest assured the foot of it is a nice chocolate brown, and the center a nice beige. No green here! I Love it. Mine is a King. I will say, that if your looking for that fullness like in the picture, it's not there. But, enjoy it all the same. I ordered this comforter set because of its masculine look, and because of all the great reviews from people that had ordered it previously. Thought it was beautiful. Reviews were great, that is important to me. "Is this a heavy weight comforter?" it isn't really heavy. It is soft and snuggly. I haven't experienced it really cold so I can't tell if it would be sufficient in the far north.